On the surface of the Earth planet, water is everywhere: very visible in oceans, rivers, rain or clouds, less visible in rocks or even in the body of living organisms. Being almost the only easily accessible natural liquid, many processes depend on its properties. No life would be possible without the presence of water in its three states. Moreover, its properties play a major role in seasonal cycles and in weather stability. From the largest scales of ocean currents till the molecular scale of biological reactions the singularity of water is evident. As a consequence, water is at the core of research in a large variety of scientific disciplines, as it is nicely presented in the first chapter of this book. One may ask why, more than any other substance, is water so important and subject of a huge literature, given the apparent simplicity of both the chemical composition and shape of the molecules. The answer cannot be simple because, indeed, complexity comes from different origins, such as the local tetrahedral arrangement or the intermolecular hydrogen bonds and their fast dynamics. The great merit of the presentation of J. B. Mandumpal is the gradual introduction of the main concepts of the physics of water, with a pedagogical approach based on experimental results and on computer simulations. The text encompasses essentially all the properties of water from the better known till the still controversial models of supercooled water and glass transition. Given the amount of data available and the enormous number of research papers (more than 400 publication every day! ), the content of the book constitutes a remarkable review of the state-of-the-art in water physics, which will be source of information and inspiration for graduate students, scientists and engineers. Water is one of the most puzzling substances on earth despite its relatively small size and simple molecular formula. Importance of water in our life need not mention to the scientific community any further as numerous theoretical and experimental investigations have already been performed on water, and staggering volume of research work has been appeared for last several decades in hundreds of scientific journals and books. The second half of twentieth century witnessed a sudden expansion of scientific repertoire due to the refinement of the existing experimental equipment with better resolution and the introduction of computer simulations into basic and applied sciences. It has been widely accepted by now that both experiments and simulations are not independent subjects; rather they are mutually complimentary disciplines; this warrants much more concerted effort in future for better understanding of complex systems like water. 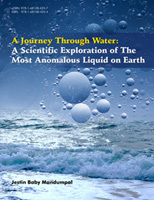 The proposed book, titled, “A JOURNEY THROUGH WATER: A scientific exploration of the most anomalous liquid on earth”, is an attempt to provide the reader an account of computational and experimental investigations on water. This work is expected to serve the reader as a useful secondary source of information, with appropriate references to the primary sources, research articles and reviews by pioneers in the field. In addition to the anticipated readers of the book (physicists and chemists), scientists and engineers who indulge in water−based investigations, for example cryobiologists and chemical engineers, can also make use of this work for sharpening their understanding on water. The contents of this book are presented in such a manner that a person with minimal understanding of physics and chemistry can comprehend most of them without much laborious effort. An important feature of this book is the way by which the introductory chapter has been presented, contrary to the traditional approaches: I venture into providing a wider outlook to water from a socio−economic, political and technological perspectives. This, I hope, will make the scientific community much more aware of the importance of their research, and prompt to design their aim according to social needs as well. The first four chapters serve as a platform for the subsequent five core chapters (5-9). Chapters from 2 to 4 are devoted to cater the needs of people who do not have fundamental understanding of various simulation and experimental methods as well as theories that have been developed over the years for explaining the properties of water and liquids in general. Conceived in the beautiful city of the South African coast, Capetown, I proceeded to write this book part by part in several countries including the Republic of Maldives where I was later appointed as a Teaching Service Officer (TSO) under the Ministry of Education of the Republic, and Baku, where I am living now. Completion of this book was a long haul, and took more than three years to the present form after several reorganisations of the chapters. Even the title of the book has been revised several times: initially I thought of focussing mainly on computational investigations of water, but had to change my mind since such a move would become futile attempt given the fact that neither experiments nor computer simulations are standalone as I mentioned before, at least in the case of water. I thought to include clathrates suggested by one of the reviewers, but had to abandon this idea due to the never ending task of completion and also non−familiarity of the topic, but it will definitely be included in my future assignments! This book is dedicated to my departed father Baby Mandumpal, who has been very inspirational in my life, and other family members including my mother Filomina, wife Priyanka and our little daughter Joann. I would like to thank Professor Ricardo L. Mancera at Curtin University for introducing me to this marvellous topic and for the stimulating discussions during my PhD research. I owe much to him for the training I obtained during my stay in Perth in the art of scientific presentations and more importantly structured academic writing. I would like to mention my gratitude to Professor Hamlet Izaxanli, the president of Khazar University, and Professor Hassan Niknafs, rector of Khazar University for inviting me to the wonderful city, Baku. I confer gratitude to my friends Rev. Dr. Paul Kattookaran (Co-ordinator, Art-i (Indian Christian Artists’ Forum)) for motivating me towards fulfilling this task, Dr. Rajesh Komban (Research Scientist at Center for Applied Nanotechnology (CAN) Hamburg, Germany) and Dr. Thiruvancheril Gopakumar (Assistant Professor at Indian Institute of Technology, Kanpur) for providing numerous manuscripts for the completion of this book. Without these vital supports, this book could not have been materialised. I thank Professor José Teixeira (Laboratoire Léon Brillouin, France) for his willingness for writing an appropriate “Foreword” to this treatise. Finally I thank Bentham Science publishers for inviting me to write this book and in particular their acquisition editors Ms. Dur−e−Shahnaz Shafi and Ms. Humaira Hashmi for reminding me the deadline constantly. In fact, there are more people that I could mention here, I tender my apology for not including all of them here. As one of the prominent theoretical physicists of our era Stephen Hawking in the preface of his seminal book “A brief history of time − from big bang to black holes” mentioned, the more one includes complex mathematical equations in a book, the more readers can be deterred from it. I support for the notion of books written in plain language, especially when they are aimed at general audience, for quick understanding of the subject. As a result, I tried to minimize the number of mathematical equations as far as I can, without losing the rigour of the subject. I have tried my level best to provide the already available research work (most of which are written in academic language with complex physics and mathematics) that has been carried out hitherto on water as much as I can. Nevertheless, the expanding volume of research on water year by year makes this work an endless task. I would therefore encourage readers for making constructive criticisms on the content of this work. This book’s shortcomings, in terms of its contents and style, weigh heavily upon me. I can only say that this book does not serve to account of everything we know about water. Nevertheless, I venture to hope that the readers will enjoy a short journey through this book!